Since the early 1990s, the food and pharmaceutical industries have relied on x-ray technology to detect potentially harmful foreign bodies, such as glass and metal, to protect consumers and maintain brand reputations. But can x-ray inspection do more? Could x-ray technology be a multi-tasking defender of product safety and brand quality? 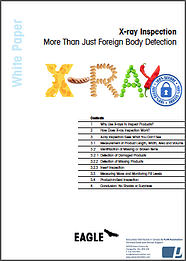 This white paper looks at the potential of x-ray inspection to solve a wide range of product safety and quality control issues typically found within food and pharmaceutical manufacturing. It explores how x-ray inspection can detect faulty products before they leave the factory, avoiding product recalls and customer disappointment. It describes how in a single pass – and at high line speeds – x-ray systems can perform several inspection tasks simultaneously. 1 Why Use X-rays to Inspect Products? 2 How Does X-ray Inspection Work?